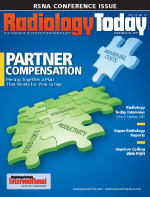 Improvements in technology and the growth of subspecialization have made income distribution more complicated than ever for radiology groups. Assimilating nuc med studies with PACS is no easy task. Facilities need to carefully consider their options when bringing the two together. Keep an eye out for these items while you’re walking the halls at this year’s show. What Struck You at RSNA? Ever since gadolinium contrast was associated with the onset of nephrogenic systemic fibrosis, radiologists have been refining their dosage protocols. Recent studies provide additional data for them to consider. Despite attempts to reduce workplace injuries, the percentage of sonographers reporting job-related pain has grown. RBMs reduce imaging utilization rates during the first year after implementation, but do they keep the rates down? A recent Georgetown University study examines that question. 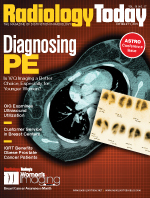 Should CT angiography, and its significantly higher radiation dose, be used instead of V/Q scintigraphy to diagnose pulmonary embolisms in young women? There is plenty of room for debate. A recent report from the Office of the Inspector General raised red flags about the overuse of ultrasound. Is it a tempest in a teapot or the symptom of a larger problem? The director of a prominent women’s imaging center talks about what patients want and how her facility tries to meet those expectations. Read about MRI news, accelerated partial breast irradiation, and another reason to drink wine. Clinicians are using dynamic MRI to monitor the growth of a deadly cancer and adapt treatments to individual patients. 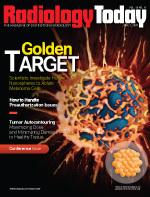 The cost of proton therapy facilities has been prohibitively expensive for all but large academic and research facilities. However, that’s beginning to change. Make sure your practice has everything it needs before the cold weather sets in. How Much Imaging Training Does a Radiation Oncologist Need? 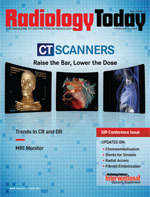 Radiology and radiation oncology share a past, but what part will advances in diagnostic radiology play in radiation oncology’s future? As in real estate, location is everything when it comes to getting patients from the emergency department to the imaging department in a timely manner. 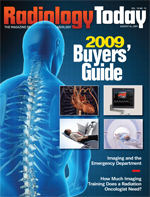 Fiscal year 2010 is just around the corner, so if there’s anything you need before the calendar flips, our annual buyers’ guide is a good place to look. P4P — Will Pay for Performance Rebuild Compensation? Pay-for-performance is often touted as a way to properly incentivize physician reimbursement. What no one knows yet is what types of rules might be brought to bear on radiology. Downtime caused by aging reactors forces imagers to cope with a Mo-99 shortage. Even if you couldn’t make it to last month’s SNM meeting, you can still keep up with some of the notable news. In recent years, new breast screening tools have added to clinicians’ diagnostic options. Now, the task of determining which options are best has begun. 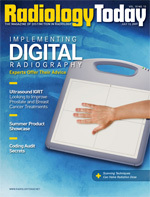 Digital radiography can help medical facilities do more with less. Experts offer some implementation tips to ease the transition. A new ultrasound system helps clinicians better visualize treatment targets better without added radiation. Getting the best cancer treatment is every patient’s goal, but many may not realize that they don’t have to go far to get it. If you’re looking to upgrade your equipment this summer, here are some hot items to consider. Comparative effectiveness research aims to provide clinical data to guide care, but interpreting the findings of such studies can be tricky. A radiation oncology department dramatically reduced its wait times by asking patients how to improve care. Have a look at some of the latest CT research presented at the American Roentgen Ray Society’s annual meeting. Researchers are studying a targeted treatment that may potentially allow them to destroy melanoma tumors while minimizing damage to surrounding tissue. 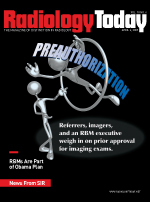 Imaging providers must walk a fine line when it comes to exam preauthorization. Here are some tips for sticking to the straight and narrow path. Radiation therapy planning can be challenging, but automatic tools for tumor contouring can improve accuracy, reduce patient discomfort, and save valuable time. Accidents happen, even on cruise ships. To help deal with these unfortunate events, one cruise line is installing CR suites to improve and expedite diagnoses. 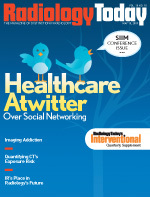 Social networking sites are exponentially growing in popularity, and healthcare organizations are starting to take notice. PET and fMRI help clinicians to study the complex brain processes associated with addiction in ever-greater detail. But are they any closer to more effective treatment? Find out what the president of the Society of Interventional Radiology has to say about the state of the specialty. 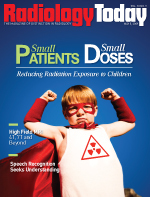 Reducing pediatric radiation dose is a complex task, but radiologists and technologists all over the country are working to highlight its importance. High-field MRI is already being used to study the brain, but researchers believe it may offer other uses as well. 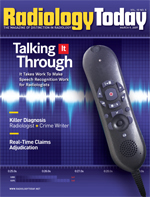 Many radiologists have been reluctant to use speech recognition, but as the technology improves, it’s winning converts. Your images are only as good as your ability to process and store them, so take a minute to consider upgrading your PACS or RIS. 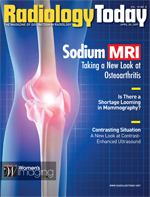 Sodium MRI has been around for a while, but higher magnet strengths and new technologies have increased the potential for significantly earlier diagnosis of and possible treatments for osteoarthritis. Other than in cardiology, contrast-enhanced ultrasound isn’t used much in the United States, but that may be changing. Is There a Shortage Looming in Mammography? Recent forecasts indicate that the number of radiologists and radiologic technologists for mammography may not keep pace with demand in the coming years. What effect will this have on patient care? Enhance your spring cleaning by updating your equipment. Get the scoop on some of the new research that was presented at the Society of Interventional Radiology’s annual meeting last month in San Diego. 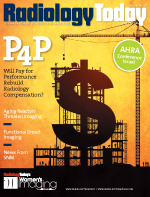 Is preauthorization a way to ensure appropriate imaging or reduce imaging costs? It depends on whom you ask. Everyone agrees that healthcare is too expensive, but there’s a lot of disagreement about how to trim the cost. Many in the radiology community are concerned about the inclusion of RBMs in the president’s strategy. Ultrasound Exams — Bright Future, but Will It Be in Radiology? Ultrasound’s popularity continues to grow, but will it outgrow the radiology department? 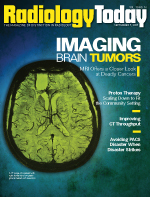 Advances in CT technology are allowing clinicians to do whole-brain perfusion studies. 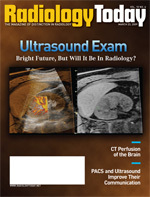 PACS and ultrasound interoperability still isn’t perfect, but it’s come a long way. Will Your Group Be Ready? Implementing speech recognition isn’t easy, but the end results are worth the aggravation. Getting medical claims processed at the time of service benefits patients, as well as medical providers. When he’s not busy interpreting MRI and CT scans, Keith Wilson is dreaming up inventive ways to kill people—in writing. DR is making serious inroads in CR’s territory. Increased speed and decreased radiation dose are the twin engines driving the latest advances in CT technology. Here’s what the large manufacturers are rolling out. The International Symposium on Endovascular Therapy held its annual meeting last month. Here’s some of the news that was presented. 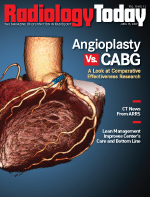 Take a look at these tools for your interventional radiology practice. New data-mining capabilities allow radiology practices to analyze their business in a completely different light. A novel PET tracer is helping clinicians track the location and progress of specially programmed white blood cells. Radiologists are in a position to help identify a form of self-mutilation that most clinicians haven’t seen before. 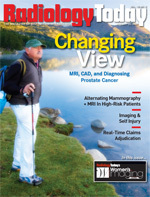 As MRI techniques and computer-aided detection software evolve, MRI may soon be an effective tool for diagnosing prostate cancer. RT talks about the state of modern breast imaging with the medical director of Toledo Hospital Breast Care Center. Stress-Related Disorders Affect Memory; Does the Brain Make the Punishment Fit the Crime? 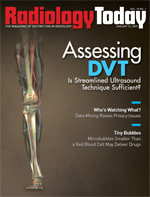 In an effort to save time in the emergency department, some doctors are advocating for a shorter test for deep vein thrombosis, but is it effective enough for wide-scale use? A new microbubble treatment that incorporates ultrasound may allow a more targeted delivery system for chemotherapy drugs. 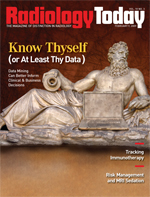 Data mining can provide a wealth of information but at what risk to personal privacy?